THE ELVIS PRESLEY/FRIDAY MUSIC 180 GRAM AUDIOPHILE VINYL SERIES CONTINUES! HAPPY BIRTHDAY TO THE KING OF ROCK & ROLL -JANUARY 8, 1935!!! CELEBRATING 6 DECADES OF ONE OF HIS BIGGEST SOUNDTRACKS EVER! FIRST TIME STRIKING GATE FOLD ALBUM COVER PRESENTATION! FIRST TIME 24" x 24" POSTER!! MASTERED IMPECCABLY BY JOE REAGOSO & PRESSED AT R.T.I. Elvis Aaron Presley was born during the Great Depression into a poor family in Mississippi. They moved to Memphis during the early fifties. He cut some demos at Sun Studios as a gift for his beloved mother Gladys, which would become the beginnings of a soon to be worldwide superstar unlike the world has ever known. The folks at RCA Victor knew that this young fellow named Elvis was destined for super stardom. They quickly bought out his contract and signed the legend to a long-term deal, forever etched “The King of Rock and Roll” trademark to his name. Over the next three decades, Elvis Presley would release dozens of hit albums and tons of smash singles, spend time in the Army, star in over 35 top charting films, as well as sell out concert tours around the states and Canada making him the most successful solo artist of all time. Upon his release from the Army, his career ignited even further thanks to his highly successful "G.I. Blues" movie and companion multi-million selling soundtrack album. Already gaining popularity in thanks to two single smashes "Tonight Is So Right For Love" and Bert Kaempfert's ( future Beatles' producer) "Wooden Heart", this masterwork soundtrack album also included a treasure trove of Elvis Presley tracks that captured a very great time in the musical history of this iconic legend. As the movie would become a major box office smash, The King kept his audience wanting more as the LP would go on to become one of the biggest soundtracks album of his career and one of the biggest soundtracks of the sixties. Even more hits abound with the sensational classic title track "G.I. Blues" , the blues rocker revisit of Carl Perkins' "Blue Suede Shoes" , and the powerful rockers"Shoppin' Around" and "Frankfort Special." All in all, 11 huge Presley smash recordings, all on one sensational album. This amazing soundtrack has been out of print on vinyl for several decades…that is until now! In honor of the Man, the Music, the Legend, the King of Rock and Roll, Friday Music is very proud and honored to announce the first time limited edition 180 Gram Audiophile Vinyl release of the RCA Records classic "G.I. Blues" by Elvis Presley. As we further continue our exciting Elvis Presley 180 Gram Audiophile Vinyl Series, we are pleased to present this masterwork now mastered impeccably by Joe Reagoso at Friday Music Studios & Capitol Mastering and pressed at R.T.I. for a super limited time on stunning Yellow Vinyl. "G.I. Blues" will be a much anticipated audiophile dream release for Elvis fans everywhere! For this exclusive release, we are also including a first time limited edition gate fold album artwork presentation, and a striking 24" x 24" full color poster. 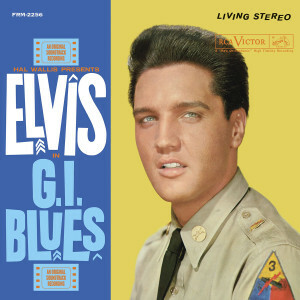 Elvis Presley’s #1 "G.I. Blues" …A history making album from a historic legend, an audiophile dream release…first time 180 Gram Yellow Audiophile vinyl…is now an audiophile vinyl dream come true…From your friends at Friday Music!